...and I was wondering if anyone had any words of wisdom before I go trashing my car like a numbskull. The kit is from "Mr. Bodykit" and is the "GT look" but MADE TO FIT THE V6. There are no instructions with the kit, but from what I can see, swapping out the grill is straightforward. My car already has the switch, wires and harnesses because it's got the Pony Package fogs already. There is a plastic panel that covers the radiator, and that should pop off using a screwdriver to pry out the little pins. The grill tabs "should" bend sufficiently to allow the grill to just slide out. Am I missing anything here? 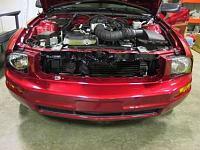 Thats all, the tabs on the grille are very rigid and will seem as if they are going to break. The trick to use a screwdriver and a paint can opener. The tabs are black and behind them is a slot that looks like [ to get enough clearence to pop out the tabs; first use a screwdriver to lift the plastic piece, then carefully slide the end of the paint can opener under the [ piece. This should move the plastic tab of the BUMPER UP and allow you to PUSH the grill tab back and pop it out. Sometimes the paint can opener wasn't enough alone to make enough room for the tab to come back enough to have enough room to clear the lip. To solve this i slid the screwdriver under the stock of the paint can opener to use it as a lever and allow more clearance for the tab to fully come back to pop out. this process is simple, just use enough force necessary and dont over do it, if it doesnt come at first try using the screwdriver. 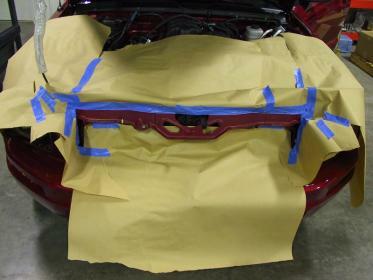 You may also need extra help for reaching the lower tabs because they are hard to do from the top, so someone underneath can help guide the screwdriver and paint can opener under the plastic tab on the bumper. Yeah the cover is held in by 'push pins'. Pry up the center pins, then if you can, just pull out the whole push-pin assembly, or wedge under it as mentioned above. You put them back in opposite: make sure the pin part is pulled up, push in the round outer part, then push the pin down. 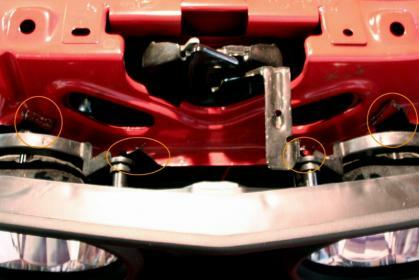 For removing the grill, it might help to disconnect the grill where its center supports connect to the car; uses a 10mm screw. The grill is held in by tabs that stick up on the grill pieice. You have to push down the tab and push out the grill. Youll have to work one tab at a time and keep the other ones from working back in. Take your time and it will all come out. The first time you do it is a little tough until you figure out how it all goes together, then its a breeze. Thanks, guys. As I tried to remove the plastic panel above my radiator, I managed to break the first push-pin I tried to remove. The center piece popped up easily, but when I tried to pry out the entire thing it just broke off. I need to get the grill out as gently as possible, as I will be selling it as "excellent condition" and packing it into the box from my new one. When you say 10mm screw, do you mean screwdriver, or is there an actual screw that needs to be removed? Thank you! Last edited by Ken Rogers; 03-09-2009 at 10:58 PM. Get some Pop Sickle Sticks Cut them up into 1 inch long parts then stick one into each slot over top the grill tabs then pull it out. 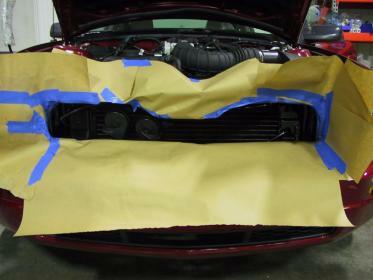 Think about the new grill before you install it if the new grill will show any of the Bumper tabs more the the stock grill you may want to take this time to paint them Flat black before installing the replacement grill. Good Luck and have fun this is a easy mod to do. the grill from the headlight. The bolt(s) one per side are on the top. You can gain easy access from underneith, just avoid the A/C condensor fins. thats behind the grill while you have it out. 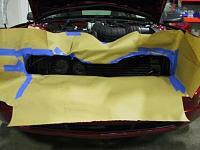 Also check for proper fit with the rear of the fog lights and the sheetmetal. Unfortunately, I broke a tab during removal today. It's so cold out, the plastic just doesn't have much forgiveness. Should still fit solid for someone else to use, but I will likely have to come down on the price a little. Also, my horn is in the way. I have unscrewed it and moved it over to the right, but I will have to somehow extend the hanger so that the horn can sit farther over. Horn? Unless they relocated it, it shouldnt be in the way of removing the grill. I bought a grille from Blue Oval industries. They claim the grille fits with no mods but it does not. 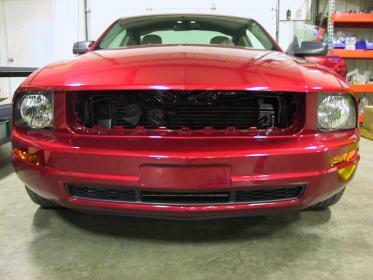 This is the grille with the fog lights a little in from the outside corners. The fog light brackets hit the horn, the horn bracket and the sheet metal surrounding the horn mount. I relocated my horn and attached it to the passenger side shock tower. I threw away the horn bracket and used a hack saw to trim away the proper amount of sheet metal. The area that has to be trimmed is covered by the big plastic trim piece so in the end it doesn't really matter but Blue Oval is deceptive in their advertising.